Consumers are drawn to businesses that support a cause and companies like Toms, Zappos and others have figured out the formula needed to not only make a living but also make a difference. Joining us today to talk more about building a socially responsible company is Jess Ekstrom, founder and CEO of Headbands of Hope. Jim Fitzpatrick: Welcome to the Atlanta Small Business Show Jess. Jess Ekstrom: Thanks for having me. It’s great to be here. Jim Fitzpatrick: Sure. So for the viewers that are watching right now, tell us all about Headbands for Hope. How did you get started? Why did you get started? What was the motivation behind it and such? Jess Ekstrom: Yeah, believe it or not, started in Disney World. 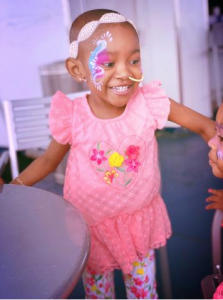 I was there as a photographer when I was in college and one of my favorite things I got to do is I got to photograph kids that were there on their wish through the Make a Wish Foundation and I just fell in love. Jim Fitzpatrick: You were hooked. Jess Ekstrom: Yeah, I fell in love. I was hooked. I got back to school at North Carolina State my sophomore year, interned at Make a Wish and I was seeing a lot of kids that were losing their hair to chemotherapy. And the reaction would be to offer a wig or a hat, something to cover up their heads. But I just thought it was so great when they come into the office or I see pictures and they’d be wearing headbands as a way to not hide their experience but restore it. Jess Ekstrom: Yeah, embrace it. But I did a quick Google search, realize that no one really had made that connection yet between hair loss for the kids with cancer and headbands. And I’m 18 years old. I started Headbands of Hope. For every headband we sell we donate one to a child with cancer. Jim Fitzpatrick: Wow. Startups would require financing obviously. And it’s a question of are we okay now you’ve got this great idea, there’s a lot of the people that are watching right now that say, oh, well I’ve got an idea like that. So what’s the next step? Share with us a little bit about how things got rolling. Jess Ekstrom: So I mean, you’d be amazed of how much you can do with very little and just by starting with the bare bones of what you need. I realized I didn’t need to start that big, started with two headbands, a couple of hundred dollars and I’ve just bootstrapped it and grew it from there. Jim Fitzpatrick: That is so cool. Jess Ekstrom: So do what you can with what you have right now instead of thinking about what you don’t have and what you need. Jim Fitzpatrick: How did you go about building the follow-up? Jess Ekstrom: I think the beautiful thing about having a company that gives back is people want to talk about it, so give them something to talk about. So another thing that we started doing a few years ago was donation confirmation. So after you order on the website, two weeks later you’ll get an email that has the exact hospital that your headband benefited. Jim Fitzpatrick: That’s really cool. Jess Ekstrom: And so it gives them another reason to talk and to share and tell people about their headband. So give the story, give people reason to talk about you and you’ll see that growing your following. Jim Fitzpatrick: Yeah, for sure. So I would imagine social media plays a huge presence. Jess Ekstrom: Huge, and it’s always changing. You always have to keep up with it. And so I think a lot of it is about knowing your customer and who they are and where they’ll be and getting in front of them and not feeling the pressure to be everywhere. Jim Fitzpatrick: Your headbands are found in stores now all across the nation. Jess Ekstrom: Yeah, all across the nation. Jim Fitzpatrick: So tell our audience, how you formed these relationships with so many retailers. Jess Ekstrom: Right here in Atlanta. I remember the first time I went to an America’s Mart Show right downtown and I was, had all my suitcases and I was like, where do I go? What do I do? But that was the first time we started getting these boutiques that were signing up to carry our stores. And now we’re in close to 2000 retailers across the US. Jim Fitzpatrick: Oh my gosh. That is phenomenal. Jess Ekstrom: Yeah. So it’s been amazing. Jim Fitzpatrick: So looking down the road five years from now, where is your company, Headbands for Hope? Jess Ekstrom: My first reaction is a weird answer. I hope that we’re not around. That would be great if we helped solve the problem that it initially started with. Jim Fitzpatrick: Or maybe switch the cause. Jess Ekstrom: Yeah, exactly. But I think it, um, I think the greatest exit for an entrepreneur who started by a problem would be that problem was solved. And so if we can be a part of the cure or part of the solution, it would just be amazing to be able to chug along in that process. 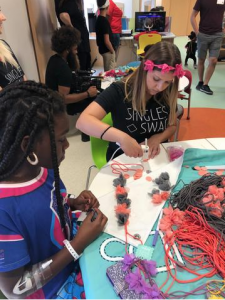 But other than that we started doing a DIY headband days where kids can design and create their own headbands and proms at children’s hospitals. We actually did a DIY headband at Scottish Rite in Atlanta a few months ago. Jim Fitzpatrick: Okay, very cool. Jess Ekstrom: So ways that we can help move the kids and, you know, get their hands dirty and just feel a little more like kids. Jim Fitzpatrick: Well, I want to thank you so much, Jess, for coming into the Atlanta Small Business Show. We appreciate it. I know our viewers are bound to get a lot out of it because there’s so many people out there that are just on the cusp of something and they don’t know, should I, should I not? Does it make sense? Obviously, you took the plunge and it worked out very well for you. Jess Ekstrom: Yeah. Keep pushing and I’m happy to be here, so thanks for having me. Jim Fitzpatrick: Congratulations on your success and hopefully we can have you back in a few months to see everything going on. Jess Ekstrom: I would love it. Jim Fitzpatrick: Great, thank you so much.